Scammers love to prey on older victims. They often have money and they're usually very trusting. Easy pickings for the bad guys. There are three scams that seniors and their families need to be especially aware of. The first is the grandparent scam, which has become extremely widespread over the last five years. A young sounding scammer calls an elderly person, calls them “grandpa” or “grandma,” and hopes the victim will give them a name. After that, the scammer pretends to be a grandchild in distress, usually in a minor scrape with the law. The scammer pleads with the victim not to call the parents, but instead to wire money to pay a fire or post bail. Michigan Attorney General Bill Schuette says in one case, Michigan grandparents wired $3,000 to someone they thought was their grandson after he called and claimed he was caught fishing without a license in Canada and needed to pay a $3,000 fine. They sent an additional $30,000 after the phony grandchild called back to say that alcohol and drugs were found in his boat and he needed $30,000 to post bond to get out of a Canadian jail. 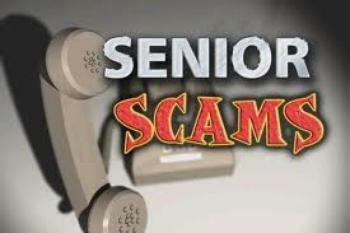 A second danger scam for senior is the 419 email scam. It's been around almost as long as the internet. Named for a section of the Nigerian penal code dealing with fraud, this scam targets generous and goodhearted individuals, with a scammer pretending to someone who needs help – and money – to come to the United States. In the past the scammer pretended to need assistance moving a large amount of money, promising the victim a cut. These days, the scammers are more likely to appeal to their victims' goodness. Police in Marion, Ohio say a 73-year old woman there was bilked out of $150,000 by a scammer who was “desperate” to travel from Egypt to the U.S. Meanwhile, police in Palm Beach County, Florida say several elderly residents have received calls from someone pretending to be an employee of a bank. The victim is told their debit or credit card account has been hacked and that the bank will send someone to their house to pick up the compromised card. While the scammer has the victim on the phone, he tries to learn to card's PIN. Needless to say, banks do not send employees around to customers' homes to pick up compromised debit cards. They simply mail new ones. Adult children should discuss these, and other scams with their elderly parents, urging them to never reveal private information to someone who calls or emails.